These 10 no heat hairstyles are exactly what your hair has been begging for! Whether you’re trying to grow your hair out, bring some life to your locks or shave a few minutes off your morning routine, having a few no heat hairstyles under your belt is a good idea. They can be super beneficial for a number of reasons, the health of your hair being the biggest. 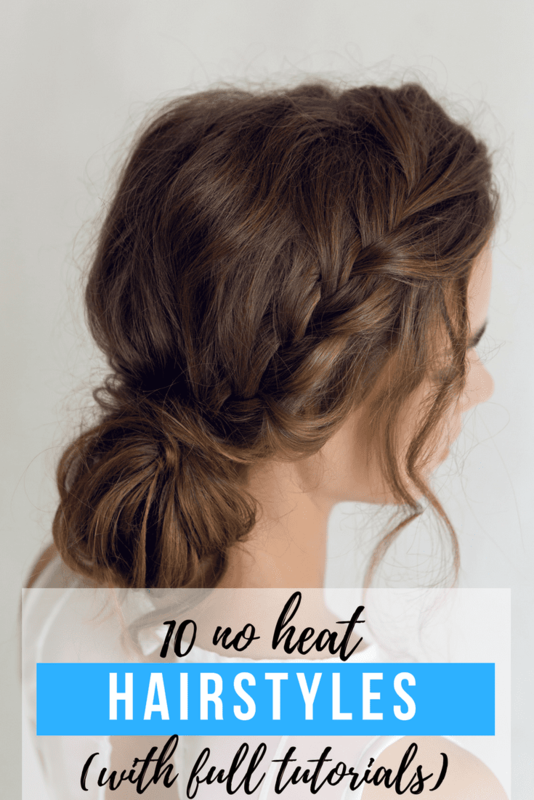 Some women participate in a no-heat challenge, usually starting around the end of May, and going through the summer months. If going that long seems a little drastic, try it for 2 weeks and see how your hair benefits from the lack of hair dryers, curling wands and straightening irons. I don’t know about you, but if I went with no heat AND no products, no one would want to be seen in public with me. Those mug shot photos we see where the woman’s hair is one hot mess – that’s what I look like. So, hair product it is! Goody QuikStyle Paddle Brush – This magic little brush helps remove excess water while you brush. It’s magical, like a unicorn. Arvazallia Hydrating Argan Oil Hair Mask and Deep Conditioner – If your hair is damaged, this is the time to show your hair some serious love and this mask is ah-mazing. Alright, let’s get into the no heat hairstyle tutorials, shall we?